If there is an item in our office that is meant to be everlasting then it’s, without a doubt, the good old paper. Although we live in the digital era, where we rely heavily on electronic file formats, most of us still have a lot of paper based documents, lying around cluttered. And as the concept of paperless office has reached a popularity milestone of its own, we also have a clever way of using those documents in our daily work, through scanning and saving them in the most popular file format for archiving documents – the PDF. The above mentioned document management workflow is very simple: we scan the documents, export them into PDF and store them on our computers so we can use them later on, available at our fingertips, with room to spare. One of the reasons why we picked up so fast on this process is that it helps us sleep easier at night, knowing that the important information is safely tucked away on a hard drive or cloud storage. The other reason is because it makes it easier for us to reuse those scanned PDFs in a variety of ways – generate templates for different reports, edit family archive documents, customize insurance forms and many more. The tricky part to reusing paper documents lies in the fact that all scanned files are basically images, which makes them difficult to export into editable file formats. There are two workarounds to this: we can retype the scanned PDFs in MS Word, which would take a lot of our precious time, or we can convert them to Word using a tool which has an integrated OCR conversion feature. One of the tools that have an integrated OCR feature is the free online scanned PDF to Word tool that enables users to extract text from images and make it editable. The conversion process is intuitive and there are no limitations to the file size, meaning that we can accurately convert all types of PDFs. 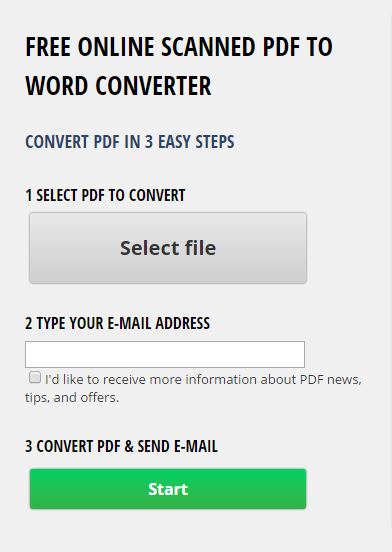 convert complex PDFs with lots of pages. Worthy of a bookmark for everyone dealing with PDFs on a regular basis, scanned PDF to Word converter undoubtedly provides a helping hand in our efforts to juggle digital and analogue file formats.